Carlos Aransay ARCM studied singing at the Escuela Superior de Canto as well as piano and composition at the Real Conservatorio Superior, both in Madrid, and composition and conducting at the Royal College of Music in London. In Vienna he pursued conducting studies with Jacques Delacôte, a pupil of Hans Swarovsky. He has conducted the London Symphony Orchestra, Pilsen Radio Orchestra (Czech Republic), the National Orchestras of Cuba and Peru, SODRE (National Broadcast) Orchestra of Uruguay, Trujillo Symphony Orchestra (Peru), Falcon Symphony Orchestra (Venezuela), etc. His involvement in opera has landed him jobs with the Earls Court arena production of Carmen (in Zurich, Munich and Berlin, with José Carreras leading one of five different casts), Costa Rica Chamber Opera ( national premiere of Suor Angelica), Midsummer Opera, Blackheath Opera, Floral Opera, etc. As an operatic chorus master Carlos has worked with the Ambrosian Opera Chorus (assistant to John McCarthy), Classical Productions Chorus (assistant to Terry Edwards and Simon Joly), Chelsea Opera Group, Midsummer Opera, etc. In 2009 he founded the London Lyric Chorus, which featured in a commercial recording with the Philharmonia Orchestra. In Lima he is music director of the new Dompablo Operetta and Zarzuela Company. Ricardo Gosalbo is a Spanish-French collaborative pianist. He has held fellowships at Trinity Laban Conservatoire of Music and Dance and the Guildhall School of Music and Drama, where he works as Spanish music tutor and staff accompanist. A devoted champion of Spanish and Hispano-American music, Ricardo combines his duties as artistic director of the Hispanic Music Series with his doctoral research on 19th-century Spanish Art Song. Ricardo performs regularly with singers and has appeared at venues such as the Barbican Hall, the Wigmore Hall, the Purcell Room, St Martin-in-the-Fields and Kings Place in London, the Chapelle Royale in Brussels, the Salle Cortot in Paris, the Gewandhaus in Leipzig, the Kulturpalast in Dresden and the Filharmonia Narodowa in Warsaw. He has also been featured on BBC Radio 3 ‘InTune’. A multifaceted music collaborator, Ricardo is a founding member of the Deco Ensemble, praised as ‘one of the UK’s foremost tango ensembles’. He has also worked extensively with contemporary dancers and choreographers, having performed with the Tanztheater Wuppertal Pina Bausch, the Deutsches Fernsehballett and the Polish Dance Theatre. He has won numerous prizes including the ‘Prix de Lied’ at the Concours International de chant-piano Nadia et Lili Boulanger, the Guildhall Piano Accompaniment Prize, the Oxford Lieder Young Artist Platform and the Paul Hamburger Prize for voice and piano duo. Eva specializes in the political and cultural history of Spanish music from the late 19th century to the present; her current project, as LKAS Research Fellow at the University of Glasgow, explores the rehabilitation of the exiled Republican musicians into Francoist Spain from 1950 to 1975; case studies include Roberto Gerhard, Jaume Pahissa, Eduardo Martínez Torner, Rodolfo Halffter, Julián Bautista, Gustavo Pittaluga Adolfo Salazar, Salvador Bacarisse and Jesús Bal y Gay. Typically, scholars of the Spanish Republican Exile have paid little attention to this phenomenon, which is usually explained under the light of the regime’s liberalization from the 1950s onwards. Her project upholds the idea that, rather than an attempt at national reconciliation, certain institutions, groups and individuals working under the regime sought to absorb the exiles and their work into pre-existing narratives of Spanish culture and, specifically, of the history of Spanish music – narratives which, in some cases, have prevailed until our days. In the past, she has published on topics such as as the musical exchanges of Francoist Spain with the Axis countries during the Second World War; gender and the politicization of folk music in 1940s Spain; Joaquín Rodrigo’s ‘Concierto heroico’; music criticism and the legitimization of violence in the post-Civil War years; or the early career of the music critic Federico Sopeña. She has also explored the reception of Spanish music in the UK during her term as McCann Research Fellow at the Royal Academy of Music. Her PhD thesis at Royal Holloway College, which she is currently developing into a monograph, studied the music press during the 1940s in Spain. Outside of academia, her main occupations are creative writing and singing. English actor, writer and stage director, he has worked with playwright Sir Alan Ayckbourn at the Stephen Joseph Theatre, Scarborough, and Chichester Festival Theatre. Won golden opinions as trainspotting chemist Francis Kebble in Ayckbourn’s A Word From Our Sponsor. Also noted for his work in the plays of Alan Bennett, particularly as Graham in A Chip in the Sugar (Talking Heads) which he has given at the legendary Mull Little Theatre in the Hebrides (premiere British repertory production). He recently played Graham again in the German premiere of Talking Heads in Berlin, which he also directed, and Guy Burgess in Single Spies at the Northcott Theatre in Exeter. Other parts have included Truscott in Joe Orton’s Loot (Dundee), Jaques As You Like It (Exeter) and Rupert in Patrick Hamilton’s classic thriller Rope (Leeds). Created Owl in the first ever stage play of Winnie the Pooh (London West End). Television includes Bugs 2, Poirot and the Ray Galton comedy for BBC Get Well Soon in which he appears as the antiquarian bookdealer Arthur Bloomsbury. 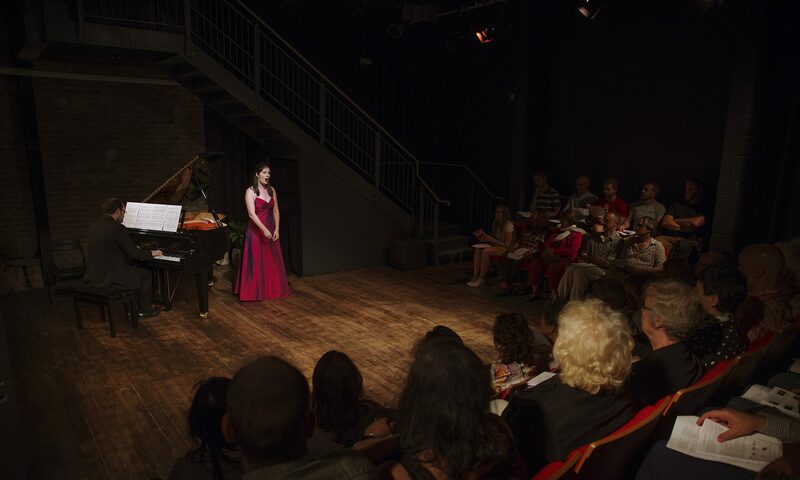 Plays include Tatyana, written for actress/alternative comedian Josie Lawrence and Nottingham Playhouse); Love and Politics, from Schiller’s Kabale und Liebe, Riverside Studios London; Dr Sullivan and Mr Gilbert, revived 1998 at Glasgow Citizens Theatre and on tour; zarzuela adaptations for Santa Fe Opera; and The Girl with the Roses for the Bloomsbury Theatre London. He is also the author of Green Tea – shortlisted for a Guinness Prize; the best-selling Bluff Your Way At the Races (Ravette); and The Zarzuela Companion (Scarecrow Press) with a Foreword by Plácido Domingo. He was a major contributor to the 2002 revision of The Oxford Companion to Music, writing on Iberian, South and Central American music. His romanza compilations for UME, Zarzuela!, have been best sellers in Europe and the USA. Directing has included Death of a Composer Nottingham Playhouse, Talking Heads Berlin, 2084 Barcelona, and a new staging of The Mikado for the D’Oyly Carte Opera Company in Britain and Los Angeles; also work on the Tokyo revival of Carmen with José Carreras and Maria Ewing. Jorge is a renowned Spanish producer, director, and actor. In the past decade he has produced 5 major plays in Spain, 4 of which he directed himself. These include the Spanish production of ‘The Woman in Black’, and ‘The 39 Steps’. He also acted in ‘The Woman in Black’ for which he won a Turia Theatre Award. Jorge is a film, TV, and theatre actor. He has appeared in more than twenty plays and has played the lead in twelve. He has appeared in thirty films and TV series, having played the lead in fourteen, and has worked with both Spanish and foreign directors. He won the Best Actor Award at the Francisco Rabal Film Awards for his role in the Spanish ‘The Best of Times’. He has also produced and directed several films and theatre productions. In 1992 he was the General Director of ‘El Palenque’ at the Universal Exhibition of Seville (EXPO 1992).For three and a half years Jorge coordinated the construction of the 10,000 sq m space, developed the artistic programme, the staffing, the management of the productions, theatre, music and dance shows, as well as a specific plan of operations for the Expo period. Under his direction, managing a team of 200 people, El Palenque presented 1163 performances, over 176 days. In addition to the official events of the companies and government agencies of the 110 countries he was responsible for personally receiving kings, heads of states, prime ministers, ministers and other personalities, and for meeting with all the teams of each country to produce and coordinate their performances. Jorge holds an MA from the Spanish Royal School for Dramatic Arts (RESAD) in Madrid and a Diploma in Direction and Production from the British Theatre Association in London. Furthemore, he holds a Diploma from The Cervantes Institute to teach Spanish as a second language.